We offer the best infrastructure to give you the best opportunities and comfort for your projects. 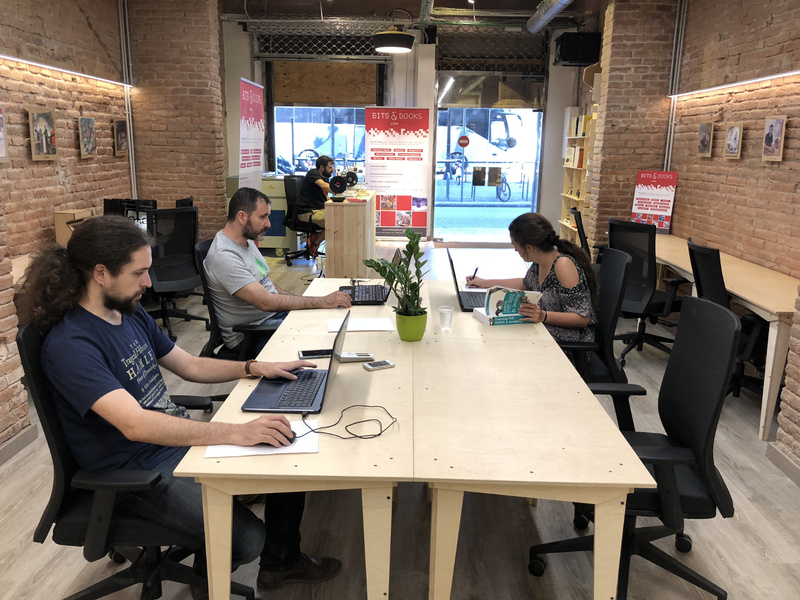 Bits & Books offers a comfortable working space, just in the Barcelona city center, with all the services required for people who need a permanent work space and also for knowmads* around the world who are passing through Barcelona or are developing their projects in the city. *The term knowmad is a neologism that combines the words know and nomad,and serves to define a new profile subject. A knowmad is an innovative, imaginative, creative person, who has the ability to work collaboratively with almost any kind of person, at any time and place. 24/7 option for monthly rental options. 8:00 to 20:00 from monday to saturday for weekly / daily rental. Meeting room available up to 8 people. Shared work and electronics area with tools. The tools are free to use and shared with the users community. Special prices for laser cutter and 3D printers. Rest area with sofa and selection of latest technical books and magazines. Electricity plugs and high speed WiFi internet included. National and international courier service at special prices. Fax service, document scanner and copier. We have a self-service cafeteria nespresso and a selection of pastas and daily handmade cookies. Monthly and weekly subscribers can use full kitchen zone with microwave and fridge free of charge for their daily needs.